This necklace is something rather special and unique. Not only is the seahorse a symbol of good luck, this piece of jewellery is reminiscent of lazy sunny days on the shores of the Mediterranean - away from the hubbub of life . . it has a definite feel-good factor. Help to make a friend or loved-one feel happy and send them your best wishes for good luck with this sweet seahorse necklace. 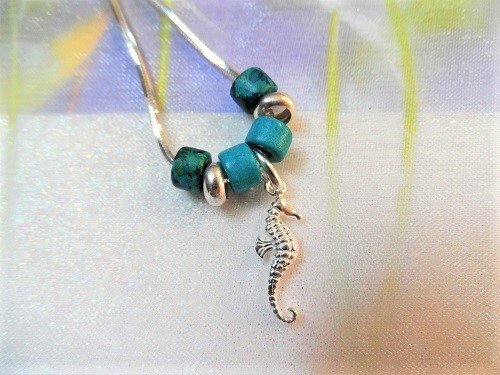 Description: Our Mediterranean seahorse necklace consists of a sterling silver seahorse charm that measures 22mm in length including the hanging ring and a mix of turquoise and Aegean coloured Mediterranean ceramic beads and sterling silver ring beads on a 16" sterling silver diamond cut round snake chain. An 18" or 20" option is also available: Please choose in options box. The Seahorse is a truly magical creature with many positive attributes. Despite its diminutive size, the Ancient Greeks thought it a manifestation of Poseidon, the God of the sea: Assured in its strength and symbolic of patience and contentment, it is unperturbed by the commotion or hubbub around it. Many islanders, sailors and others who make a living by the stormy sea, consider the Seahorse a very lucky charm. Ships gift-wrapped in a stylish presentation box. If you wish, we can print a personal message on your behalf on a gift card and include it in the presentation box. 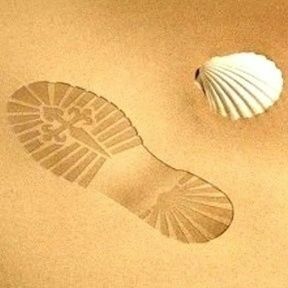 We can also ship direct to your friends / loved-ones' address if you want. This is all INCLUDED in the price.